Six members of the Arab community in Israel have been murdered since the beginning of 2019, but so far the police have made only a single arrest. This year’s first murder occurred on January 13 in Umm al-Fahm. Saher Khaled Mahmud, 20, was riding his motorcycle on his way home when he was shot dead in what is believed to have been a case of mistaken identity. 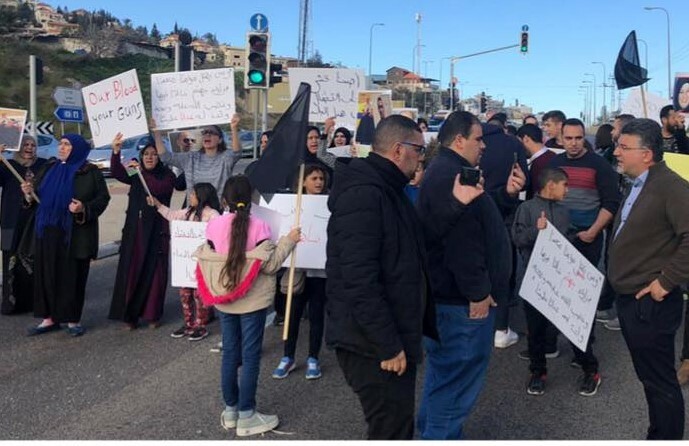 In the wake of Mahmud’s death for the past three weeks hundreds of Umm al-Fahm residents have blocked route 65 to protest the violence and rampant crime in the Arab community which, they claim, is largely ignored by the police. The second incident took place two days later on January 15 and involved a double homicide in the city of Tira in central Israel. Uday Abdelhai, 28, and Ashraf Fadili, 42, were shot to death. Last week, Nassir Aluledi, 50, was found dead near Route 40 in the Negev. Police arrested his brother, who is suspected of running over Nassir with his car. The brother denies the allegations against him. The latest two murders happened on Monday night, January 28, within an hour of each other. Ramzi Hamad, 23, was shot dead at close range near his home in Jaffa. The perpetrator, who was waiting for Hamad to come out, was able to flee the scene. Within hours, Hassib Mussa, 60, a resident of Nazareth was shot dead in Kiryat Tivon in northern Israel. “As long as the police don’t prove otherwise, I hold them responsible for not acting to eradicate the violence, as a result of the outrageous rationale of ‘divide and rule,'” Jabareen accused. On Tuesday afternoon, racist Public Security Minister Gilad Erdan inaugurated a new police station in Kafr Qasim, where he was confronted by protesters from Hadash.